How long are electrode pads supposed to last? Electrodes are disposable and usually need to be replaced about every 30 days, as they start to wear out. As electrodes age, they lose their ability to stick to your skin or conduct stimulation. You may notice that you need to increase the intensity higher than normal or that the electrodes begin to curl up around the edges, causing discomfort. If you experience any of these situations, visit RS Medical Shop to order a new supply of electrodes. U.S. Veterans will need to contact the Prosthetics Department at their local VA Medical Center to order supplies. Order new pads BEFORE you run out. Everyone’s skin is different and frequency of use is different. RS Medical recommends ordering more than one package so you are never without a fresh set of pads when you need a treatment. 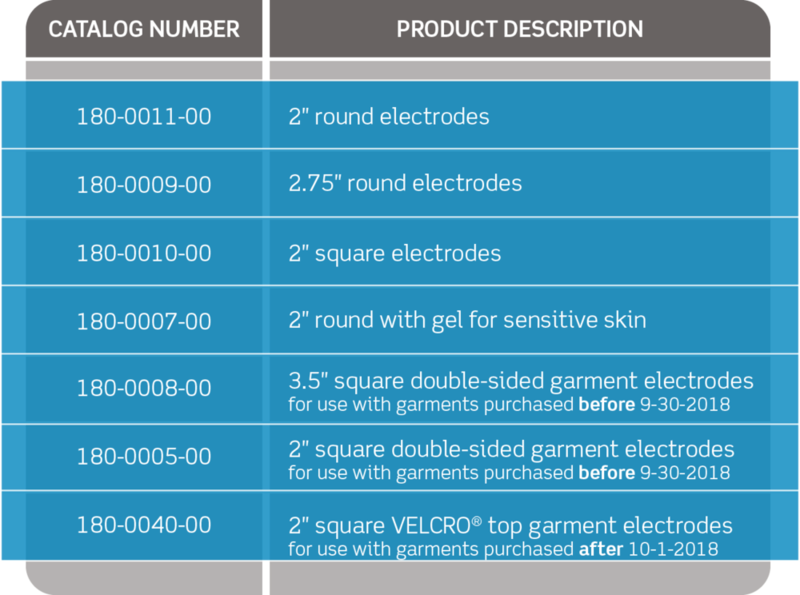 When ordering supplies, be certain to order the size and type of electrode that you are currently using, as there are many types and sizes of electrodes available from RS Medical. Is it okay to use electrode pads on skin treated with ointment, lotion, powders, or over the counter pain creams? Do not use electrodes pads on skin if the area you will be treating already has ointment, lotion, powders, or over the counter pain creams (like Bengay®, Biofreeze®, or prescription pain creams). These topical skincare products can damage or interfere with adhesive and conductive properties of the electrode gel. In some cases, the damage may render the pads useless and you will need to replace them to continue treatment. Wash and dry body areas where electrode pads will be applied. Make sure the skin in the treatment area is clean, dry, and free from lotion before using the stimulator. Lotions, oils, powders and many other skin preparations may reduce the adhesiveness and conductive properties of the electrode pads. You may also use rubbing alcohol on a cotton ball to remove any excess oils, sweat, lotions or creams before placing pads. Rubbing alcohol can cause a drying effect or reaction in patients with skin sensitivity, so do not use this method if you have sensitive skin. How can I make sure my pads last a long time? Hold the electrode pads lightly at the edge when applying or removing. Between treatments, replace the electrode pads onto their storage liners. Use wax paper if the storage liners are misplaced. This protects them from drying out and collecting dust, lint, pet hair, etc. If the gel feels dry, rub a few drops of water over the gel surface and wait approximately 10 minutes (until the gel becomes tacky) before using. Remove excess body hair from the treatment area. Many people trim body hair with clippers or shave the treatment area to improve the electrode pad contact to skin. Do not apply heat or ice therapy directly on top of the electrodes during use, as this may cause the gel layers of the pad to come apart, or delaminate, rendering the pads useless. For best results use hot or cold therapy before applying pads or after removing pads from skin. Where should I place the electrode pads? Pads should be applied to your treatment area following the instruction of the healthcare professional that prescribed or ordered the medical device. A quick reference guide of common pad placements is available below. Electrotherapy works by stimulating nerve and muscle fibers, not bone. Placing electrode pads on bony structures such as directly on the spine, directly on the shoulder bone, shoulder blades, elbow or knee cap, may not be comfortable and can cause a pinching sensation. Treatment will feel the most comfortable when pads are placed on muscle or soft tissue. If needed, pause treatment and adjust pads for the best comfort during a treatment. Pads are placed in pairs and therapy will be sent and felt between each pair of electrodes. So, it is not necessary to have the pad directly on the bone in order to treat a bony area that hurts. Make sure the pads don’t touch each other on the skin. Pads of the same channel can be as close as two fingers apart and as far apart as 8-10 inches. What will I feel when I use the RS-4i® Plus? When the RS-4i Plus is working to relieve your pain (all Pain Relief modes), you will feel a gentle, tingling sensation at the area being treated. The sensation is similar to when your hand or leg has “gone to sleep” and is a normal result of the stimulation. While using the stimulator for muscle rehabilitation (all Muscle Therapy modes), you will feel your muscles in the treatment area contract and relax. Contractions will feel like strong, comfortable involuntary muscle movements. Between each contraction your muscles will relax. For more detailed descriptions of the treatments available in the RS-4i Plus, please refer to the Instructions for Use. How often should I use the RS-4i Plus? On average, patients will take a treatment two or three times a day: in the morning, midday, and at night before bed. Use in the morning may help reduce pain and increase your range of motion so that you can accomplish normal, daily activities. Use prior to bedtime may help relax muscle spasms and reduce pain for a better night’s rest. Additional use throughout the day may be needed depending upon your specific diagnosis and response to treatment. Beware that muscle stimulation can fatigue your muscles and cause soreness the next day if you overdo it by turning it up too high or taking too many treatments in the same day. To ensure safe and proper use, you should always follow the instruction and guidance provided by your healthcare professional. Who should I contact if I need help with my product? If you have questions about your RS-4i Plus device or any of its accessories, you’re welcome to contact our Customer Service department. Our representatives are available Monday through Friday from 7:00am – 5:00pm PT. Please call 800-935-7763 or email customerservice@rsmedical.com. Please have your device number or serial number available when you call. All RS Medical products are covered by a warranty valid to the original purchaser. Normal wear and tear during use of a product is not considered a defect. The RS-4i® Plus and Pronex® are warranted to be free of defects in materials and workmanship for one year from the date of purchase. Our wearable garments are warranted to be free of defects in materials and workmanship for six months from the date of purchase. The ComforTrac™ is warranted by its manufacturer, www.comfortrac.net. To learn more about warranties, returns and repairs, download a complete copy of our warranty statement. For additional resources check out our Resource Library.